Lectures prepared for the undergraduate students at UNAM. Aristotle distinguishes between the notion of potential infinity and actual infinity. We discuss the difference. There is a third notion of infinity and that is, of everything. We explore this idea. Lastly we look at the development of the notion of infinity first introduced by Dedekind and Cantor. We shall look at both the cardinal conception of infinity and the ordinal conception. Next time someone casually says “oh there is an infinite amount of food/ time/ resources…”, you’ll have a very good idea of what he, or she, might mean and what he, or she, cannot mean. 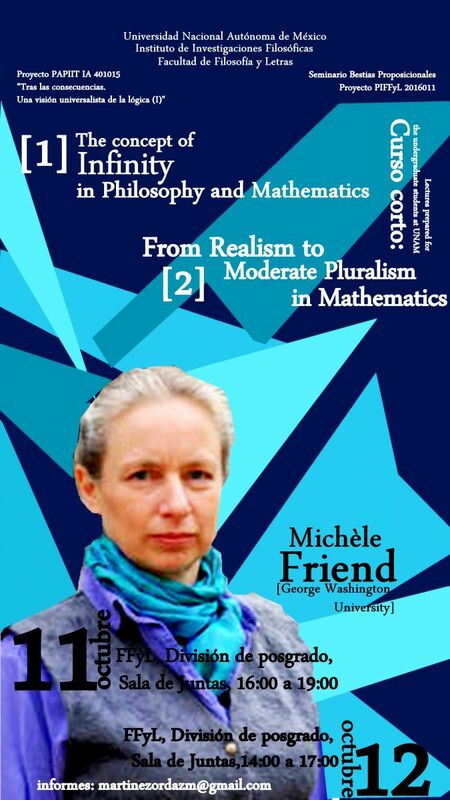 We start from a naïve realist perspective of mathematics. The naïve realist will think that Zermelo-Fraenkle set theory gives the essence, the ontology and the ultimate truths of mathematics. We discuss why one might adopt the naïve realist view. We then show that it cannot be plausibly maintained. We then discuss the position of ‘pluralism in foundations’. If the words are taken literally, then this is an oxymoron, and therefore an unstable position. We discuss how to make it stable, and how this fits well with current set theorist’s and other mathematician’s approaches to foundational questions in mathematics. After this talk, when someone says “the whole of mathematics” you’ll have a pretty sophisticated view of what is being said!